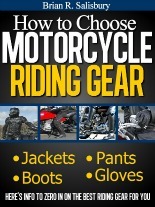 Motorcycle Riding Pants: Info to choose the best for you. The roads or trails you like to ride on.. The seasons and weather conditions when you ride..
…will add greatly to your riding comfort and enjoyment -- and safety. If you have a motorcycle accident, a good pair of motorcycle riding pants can make the difference between you severely injuring your thigh, hip or knee…or experiencing no injuries. Of course, if all goes well when you're out for a ride, a good pair of sturdy cotton fabric jeans should protect your legs okay and keep you comfortable. But if you fall, your favorite blue jeans will disintegrate immediately when they grind against the road. And chances are you're going to suffer from the impact and from abrasions. Leather pants come in many styles to suit motorcycle riders' varied needs. When treated properly to keep the leather clean and soft, your leather pants will keep you safe and comfortable for many years. Leather will give you great abrasion protection if you have an accident. And chances are your accident-damaged leathers can be repaired. But leather by itself won't absorb the impact to your knee, hip or thigh if you have an accident. So you might want to consider pants that have strategically placed armor or padding on these impact-prone areas. Leather will block out cold winds and mild rain. But, unless your garment is lined with a waterproof material such as Gore-Tex or the leather has been specially treated to make it water resistant, you'll have to wear rain pants over your leathers to stay dry in wet weather. On hot days, leather garments -- especially if they're black -- that aren't adequately ventilated and/or exposed to a continuous breeze when you ride can become very hot and uncomfortable. And removing odors from leather may be difficult. Basic motorcycle pants made of synthetics such as nylon, polyester or even Kevlar are thinner, lighter, more flexible and can be more comfortable than leather. This is particularly important in hot weather when keeping cool is a priority. On the flip side, you'll need an insulating layer underneath synthetic textiles to keep you warm in cold weather. Synthetic materials perform well in foul weather. They resist mildew and are easy to wash and keep clean. But they're not waterproof. So when riding in the rain, you need motorcycle riding pants that have a waterproof lining; or you can pull your rain gear over your riding gear. Nylon and polyester by themselves cannot protect you from abrasions if you have an accident. They'll tear or wear through when scraped against a rough road surface. But pants made entirely of Kevlar or that have Kevlar reinforcing panels covering your knees, thighs and seat can prevent road rash on these abrasion-prone areas. And similar to leather, synthetic textiles won't absorb the impact if you have an accident. That's why many synthetic textile pants give you armor padding on the knees, thighs and hips. Many riders would rather wear pants that don't look like motorcycle riding pants. That's where denim motorcycle pants come in. They're made to look, feel and perform like blue jeans and like other types of casual cotton pants. They're airy, very comfortable and will keep you cooler than leather or synthetic textile pants. But because denim alone gives you virtually no abrasion or impact protection, such protection must be built in. You can find denim pants that have Kevlar panels sewn inside to protect your knees, hips, thighs and seat from abrasions. You can also find denim pants that have impact-absorbing padding or armor on the knees and hips. I've been looking a long time for a pair of denim jeans with strategically-placed Kevlar panels on the seat, hips and thighs...pants that fit me right, look good and also give me effective padding on my knees and hips. I wanted a pair to help me stay comfortable in hot weather. I finally zeroed in on a pair of Alpinestars Resist denim jeans. But even with the safety features these and other denim jeans offer, you'll be hard pressed to find a pair of denim pants that can protect you as effectively in a severe accident as a well-built pair of leather or fully Kevlar-lined synthetic textile pants. However, when compared to department store blue jeans, you'll do yourself a big favor by wearing a sturdy pair of strategically padded, Kevlar-reinforced denim motorcycle jeans whenever you ride. While deciding which material you want your motorcycle riding pants to be made of, also give some thought to the features and capabilities you want your gear to provide. Waist design -- belt, suspenders or Velcro? What means of holding up your pants works best with your jacket and other riding gear? Most pants use a belt or Velcro closure to tighten the waist. But for some riders, crunching everything together around their waist is uncomfortable -- especially in cold weather when they wear lots of clothes, including a heated vest. So they may choose to use suspenders. If this is your choice, look for suspender buttons on any pants you're considering. If there are no buttons, it's no big deal to have them sewn on. Are you an all-weather rider who hates to stop and pull on rain gear when the weather gets lousy? If so, check out riding pants lined with a rain-blocking, breathable material such as Gore-Tex. Will your pants fit firmly over or inside your boots and stay where they belong at high speeds? If you wear your pants over your boots, make sure the cuffs will stay snug and keep out wind and water. They should pull down tight over your boots or have built-in closures to tighten the cuffs. Make sure you have a hefty zipper on the fly and everywhere else they're used -- such as on the sides of the legs for easy access or on the cuffs to tighten that area around your boots. Plus, a flap should cover each zipper to seal out wind and water. Even if your motorcycle jacket has plenty of pockets, it's nice to have one or two convenient pants pockets you can dig into easily with your gloves on. The best pockets have flaps or closures that keep the rain out and prevent your wallet or keys or any other stuff from falling out. Your knees, hips and even your seat are prone to injury from high impact and abrasions if you have an accident. They should be protected. Look for motorcycle riding pants that have padding or armor or at least good-sized Kevlar patches covering these areas. 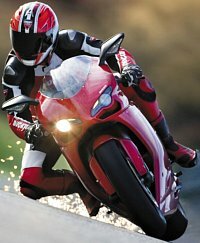 Are you an aggressive rider who often drags a knee against the road or track when cornering deep? Then you should look for pants that have knee sliders to keep the material from wearing through. Are you a multi-season rider? Then you might want motorcycle riding pants that have a removable cold weather lining. Your garment should have at least a smooth basic lining that keeps you comfortable and makes it easy to pull your threads on and off. If you're concerned about cold winds seeping under the back of your jacket -- especially when you're leaning forward -- look for a high back on your garment that blocks cold drafts. Reflective seams and/or panels are always a nice safety feature to have on any garment. After determining the material you want your pants to be made of and the features you want your motorcycle riding pants to provide, you can finish your search by deciding which pants style best suits your riding style. Motorcycle gear companies have combined many different features, capabilities and materials into these four general styles of riding pants. 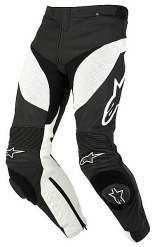 Street/Racing motorcycle pants best suit riders who travel fast and aggressively on the road or track. 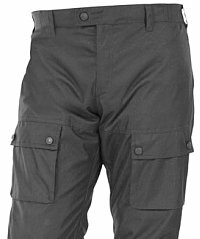 If the highest levels of protection are what you want, these are the best type of pants for you. 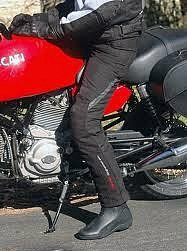 Touring motorcycle pants best suit riders who like to spend long days in the saddle in all kinds of weather across multiple seasons. This type of pants gives you day-long comfort and versatility. Cruiser motorcycle pants are made to suite the cruiser style motorcycle many riders prefer...as well as the laid-back riding style associated with such bikes. 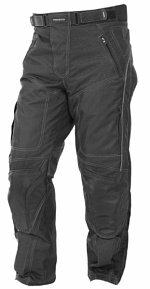 Dirt riding motorcycle pants are designed to give you great protection and unrestricted movement necessary for aggressive, action-filled dirt track or trails riding. These pants usually have "pre-curved" legs to suit dirt riders' forward-leaning position. 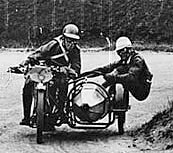 Sure, you know your motorcycle pants must fit right and make you comfortable. But keep in mind, they must continue to give you what you want mile after mile while you're sitting on your motorcycle. Your pants must suit your personal riding position. They must fit right when you're sitting with your feet on your bike's foot pegs and holding the handlebars. Depending on the bike you ride, you could be leaning forward, sitting upright or even leaning back when your hands are on the controls. And because they're designed for sitting, your motorcycle pants might not look so great when you're standing. The cuffs might be too long, the knees might be baggy and the padding -- especially the knee padding -- might not be positioned properly. The best way to determine if the pants you like fit okay is to put them on, sit on your bike and grab the handle bars. Does all the padding and protection -- especially the knee padding -- pull into place? Are the legs long enough? Do they reach well down over your boots when you're sitting with bent knees? By "seat testing" a pair of pants, you can make sure they'll fit and feel right when you need them most. And, of course, in addition to fitting right, make sure the pants you're considering look good and make you look good, too. Click here or on the book cover for details concerning the book's contents and to download your own copy.